The American Astronaut is a cult phenomenon, at least here in Boulder/Denver, where it was booked maybe a dozen times at four different independent venues. Now, finally, after years of word-of-mouth hype and independent screenings across the country, you can finally take The American Astronaut home on DVD. I watched the audio commentary with two of the movie’s biggest fans (as well as a couple of well-wishers and curiosity seekers). Between us, we had probably seen the movie 20 times. We cheered when writer/director/singer/star Cory McAbee mentioned the dance contest held in Boulder, and we paused the disc to interject our own American Astronaut anecdotes. Maybe you won’t have that much fun watching this DVD, but it should at least get you started on the road to fanaticism. The movie is a low-budget, blue-collar, rockabilly space-western. It’s also a musical, and it’s pretty funny, too. Shot in black and white, the film follows a roguish space captain, Samuel Curtis (McAbee), who transports cargo from one place to the next. He trades a cat for a girl, the girl for a boy, and the boy for a corpse, which he will take back to Earth for a handsome payment. He’s trailed by Professor Hess (Rocco Sisto), our narrator, a sociopath who kills (almost) everybody in his wake. Curtis’ travels take him all over the solar system. At the bar on the asteroid Ceres, Curtis gets jumped in the bathroom, hears the longest mis-told joke on film, and enters a dance contest. At the all-male mining colony on Jupiter he picks up The Boy Who Actually Saw a Woman’s Breast (Gregory Russell Cook) and escapes just before Professor Hess shows up with his disintegrator gun. Then it’s on to Venus (inhabited only by women and one well-treated man), but not before hiding out in an orbiting space barn where some former earthlings live in darkness, for some reason I can’t recall. The whole movie, including the music, is infused with an odd mix of working-class sensibilities and intellectual irony. The roughnecks at the bar wear leather, don’t shave, drink rotgut, and dance as though their masculinity depended on it. At the same time, the longest mis-told joke on film can only really be appreciated in a post-modern, ironic frame of mind. And our hero is subjected to the humiliation of having a Polaroid taken of him on the toilet, something you will see in no blue-collar commercial for Chevy Trucks. In music, if you mix the aggression of hard rock with ironic lyrics, you get something like punk. 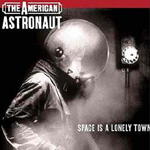 Add a little country, and you have the music from The American Astronaut. Maybe the fact that it’s all so incongruous and puzzling (and still funny) is what makes the movie watchable over repeated viewings. By far the most relevant and interesting extra feature is a “live director’s commentary” filmed in a bar in Brooklyn. McAbee stands in front of the film, projected onto a sheet, and takes questions from the audience there at the bar. He covers inspirations, casting decisions, his Sundance experience — all the usual topics you’d expect. The extra feature that got the biggest laugh was the test footage for the Ceres low-grav space walk. On film, the half-speed photography blends with the little skip-walk McAbee does to create a great, cheap, convincing special effect. The test footage, set to the same majestic rock music, was shot without costumes or lighting, at a busy urban intersection, and Cory skips around like a kid with a smirk on his face, shattering the illusion so carefully created for the film. The DVD menus are “overdesigned.” We nearly missed some of the galleries because it wasn’t clear what was a menu item and what was part of the background. We did manage to find them all, and two galleries were definitely worth looking at. One is “Sidewalk stills” — photographs of chalk drawings McAbee did in New York to promote the movie. In addition to being a writer/director/singer/star, he has a damn good hand with chalk and charcoal. The other must-see gallery is the on-set stills. These are a hoot, mostly because they are in color. Having seen the movie so many times, the black-and-whiteness of it had sunk through to our cortexes, and seeing color in the costumes and wallpaper just looked unreal. You can watch the movie in mono, stereo, or surround sound. There is no indication which is “original” or preferred, so we watched the surround-sound version. Everything sounded very good, particularly the music tracks. The movie is presented in its original widescreen aspect ratio. In conclusion, The American Astronaut is a cult favorite. As such, it may be mystifying to the average guy scanning the sci-fi section looking for the next Star Wars or Alien. But if you’re open to a little irony, mystery, and poetry, The American Astronaut is one space-western musical you should not miss.